The turmoil at Tesla Inc. (TSLA.O) has reached a fever pitch, with the news that two senior executives are leaving Elon Musk’s electric-car maker emerging hours after he smoked marijuana during a podcast interview streamed live online. Chief Accounting Officer Dave Morton gave notice Tuesday that he was resigning less than a month into the job, according to a Friday filing. Tesla’s stock plunged, then extended declines after Gabrielle Toledano, the head of human resources who’s been on a leave of absence, told Bloomberg News that she won’t rejoin the company. Morton, a former chief financial officer for computer-drive maker Seagate Technology Plc, joined Tesla one day before Musk tweeted that he was considering buying out some investors at US$420 a share and taking the company private. The CEO abandoned that effort 17 days later, and all the while drew a subpoena from the Securities and Exchange Commission and a series of lawsuits alleging market manipulation. What’s your take on Elon Musk’s podcast appearance? Tesla shares fell 6.3 per cent to US$263.24, the lowest close in five months. The company’s 5.3 per cent bonds declined as much as 4 cents to 81.75 cents on the dollar, a new low, according to Trace bond price data. Tesla has long struggled with high turnover involving its senior executives, and its finance team in particular has gone through a period of significant tumult. In the first quarter of this year, the company lost Morton’s predecessor, Eric Branderiz, and Susan Repo, who was treasurer and vice president of finance. CFO Deepak Ahuja retired in 2015, only to return last year when his successor, Jason Wheeler, quit after just 15 months. In leaving the accounting chief job, Morton walked away from a US$10 million new-hire equity grant that would have vested over four years. Friday was also slated to be the last day for Sarah O’Brien, Tesla’s vice president of communications, whose departure was announced last month. Musk, 47, sipped whiskey during a more than 2 1/2-hour podcast interview with comedian Joe Rogan late Thursday that touched on topics from flame throwers and artificial intelligence to the end of the universe. While Musk said he was “not a regular smoker of weed,” he took a drag from what Rogan said was as a joint containing tobacco mixed with marijuana, which is legal in California. Philippe Houchois, an analyst at Jefferies Group LLC with a hold rating on Tesla shares, said that Musk “seems to be on a slightly self-destructive bent.” In an interview with Bloomberg Television, he called for the company to split up the chairman and CEO jobs. Musk has served both roles since October 2008, and shareholders rejected a proposal calling for an independent chairman earlier this year. Tesla’s board of directors is on the lookout for senior talent but is not actively searching for a chief operating officer, a person familiar with the board’s thinking told Bloomberg News in August. 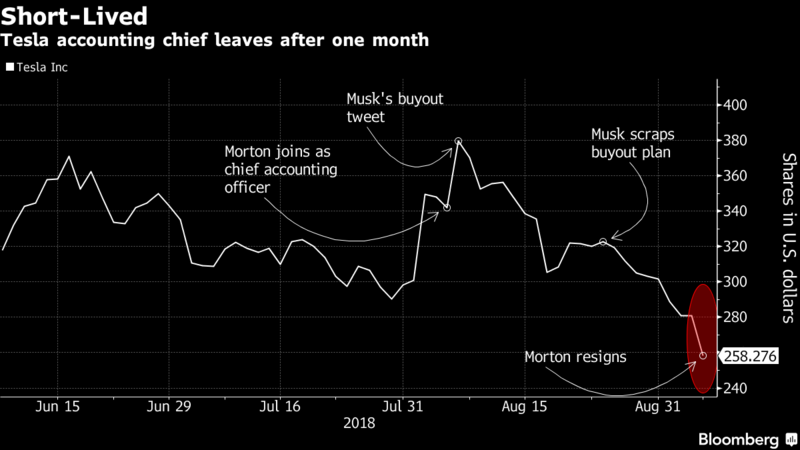 Morton and Toledano’s departures -- and Musk’s performance on the podcast -- also alarmed James Albertine, who rates Tesla a hold with a US$300 target. “Evidence is becoming more clear that Tesla needs to entertain a major change in the C-suite,” Albertine wrote in a report. “The ongoing, effectively self-inflicted public relations crisis is now affecting key personnel within the organization” and distracting the market from fundamentals that have been improving, he said.